Agalinis tenuifolia. plant. © 2009 k. chayka. Minnesota Wildflowers. minnesotawildflowers.info (Accessed 7/2017). 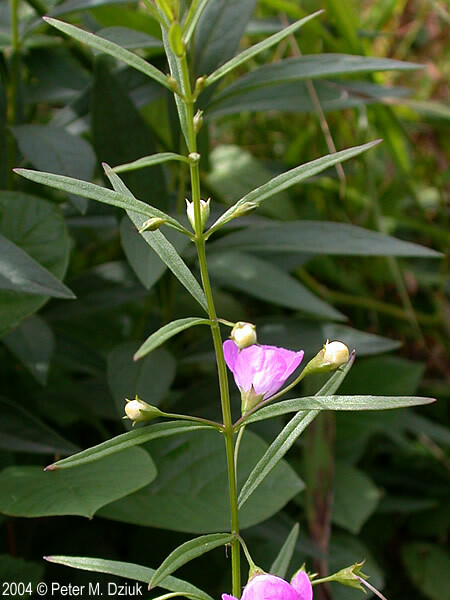 Agalinis tenuifolia is an annual herb, 20-60 cm tall; a root hemiparasite; stems thin, smooth, much branched. Agalinis tenuifolia. leaves and stem. 2004 © Peter M. Dziuk. Minnesota Wildflowers. minnesotawildflowers.info (Accessed 7/2017). Leaves opposite (alternate near branch tips), linear, 0.1-0.6 cm wide. Flowers purple with dark markings, yellow throat stripes, slightly bilaterally symmetrical, tubular, 1-1.5 cm, tube longer than petal lobes, upper lip curved forward over stamens, much longer than lower lobes, smooth inside, calyx tube 0.2-0.4 cm, lobes about 0.1-0.2 cm, flower stalks 1-2 cm long, very fine; blooming and fruiting Aug.-Oct.
Agalinis tenuifolia immature fruit. 35987-2 2001 © Peter M. Dziuk. Minnesota Wildflowers. minnesotawildflowers.info (Accessed 7/2017). 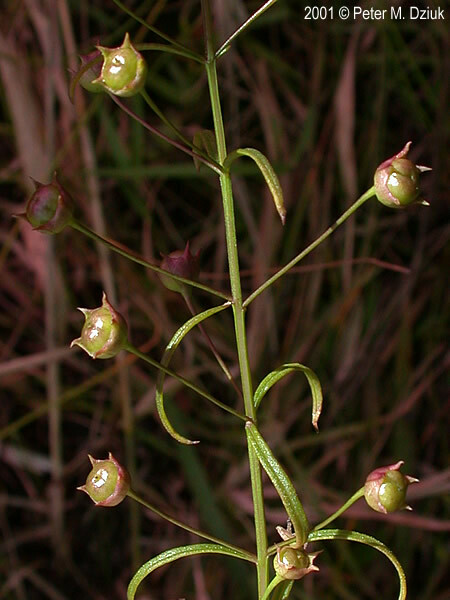 Fruit dry, hollow, a round capsule 0.3-0.5 cm, splitting open to release numerous tiny seeds. 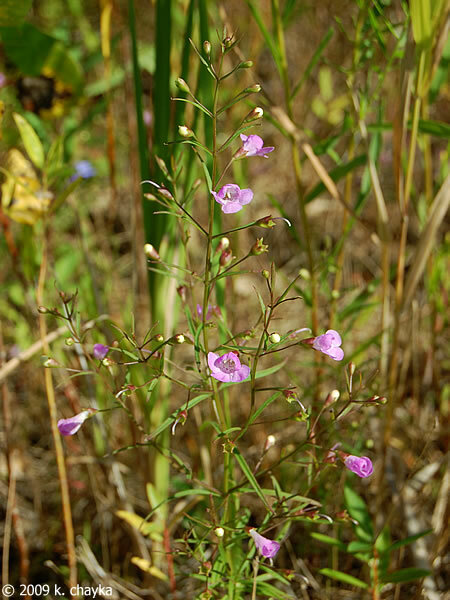 Habitat: Moist to wet open meadows, edges.